In Our National Parks, John Muir wrote, “In every walk with nature one receives far more than he seeks.” The National Park Service is celebrating 100 years of stewardship in America’s 407 national parks, and to encourage their guests to walk with nature as Muir did, The Ritz-Carlton, St. Thomas is making it easy to explore nearby Virgin Islands National Park, which covers 60 percent of St. John and is famous for its diving, snorkeling, and hiking trails through the tropical rainforest. 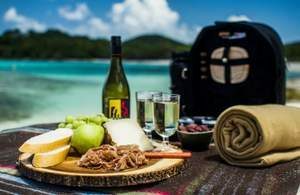 This summer, the St. Thomas beach resort’s talented chefs will prepare a picnic for guests heading over to St. John for a day of exploration. The rustic lunch, which is served in a picnic backpack ideal for hiking, includes sliced charcuterie and cheese, olives, hummus, antipasto salad, crusty bread, cookies and fresh fruit for dessert, and a bottle of wine. Trunk Bay: considered one of the island’s most beautiful beaches and features a 225-yard long underwater snorkel trail. Annaberg Plantation: featuring a trail that leads through factory ruins, slave quarters, windmill and other remains; placards along the trails describe how sugar was produced and discuss plantation life and the history behind sugar plantations on St. John. Reef Bay Trail: ideal for the adventurous, as this difficult, three-mile hike exposes hikers to tropical forests, petroglyphs, freshwater pools, and a waterfall. Solomon and Honeymoon beaches: Lind Point Trail starts at the National Park Welcome Center in Cruz Bay, and winds one mile to these two secluded beaches, only accessible by hiking or boating. In addition, the National Park offers guided excursions, including bird watching, a lionfish snorkel safari, and stargazing among others. Visit https://www.nps.gov/viis for more information.